Two Advent sessions within our Parish will prepare us to be in tune with the world away from the commercial rush of Christmas.On Wednesday 28 November and Wednesday 5 December, we will reflect on the subject of Care for our common home. In his second encyclical, Laudato Si’: On Care for Our Common Home, Pope Francis draws all Christians into a dialogue with every person on the planet about our common home. All humans should unite in their concern for our planet and every living thing that dwells on it, especially the poor and the vulnerable. His letter joins the body of the Church’s social and moral teaching, drawing on scientific research, proving the foundation for “the ethical and spiritual itinerary that follows”. Come and join our Parish Advent Events and Reflect on how we can find new ways forward together to care for our common home and finite resources in our homes, our parish, our world. 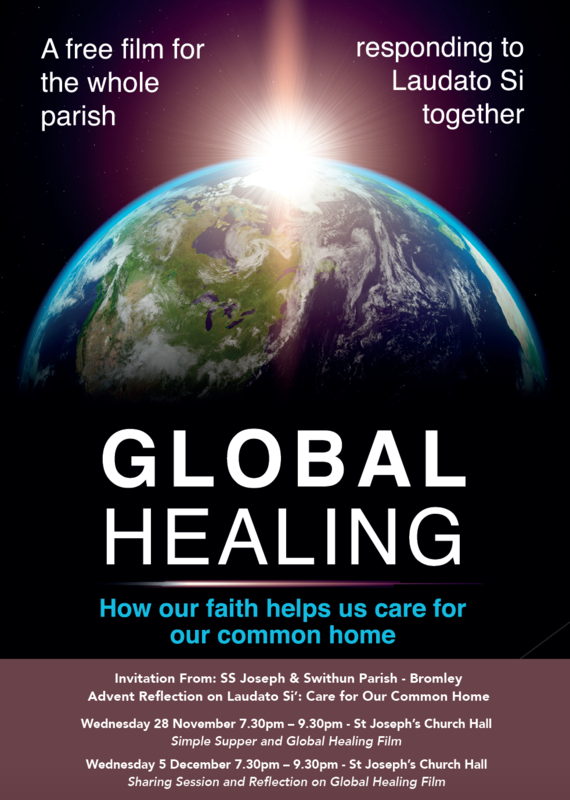 Both sessions are free and take place in the church hall from 7.30-9.30pm, and will show a Global Healing film, with the first session on 28 November including a simple supper and the 5 December event being a sharing and reflection session.